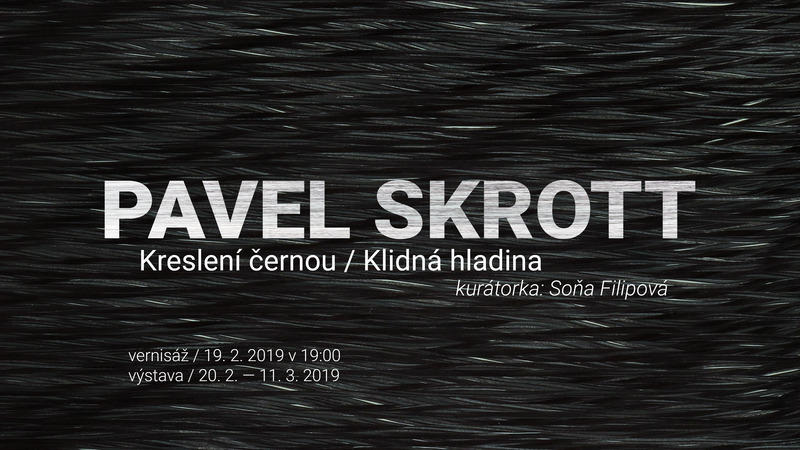 We cordially invite you to the exhibition of Pavla Skrott called Drawing with Black / Quiet Surface. Curated by Soňa Filipová. The opening of the exhibition is on 19th February at 7pm and the exhibition is on till 3rd March 2019 až do 11. 3. 2019. The exhibition’s title represents two extremities of the imaginary axes of Pavel Skrott’s latest cycle. His well-defined technique with black marker and paper (drawing in black) was the starting point, but the practice has created the surprising and unintended effect of water surface. The drawings were made in the Český Krumlov Egon Schiele Art Centrum studio with a view of the Vltava River. Perhaps this view infiltrated his technique and final work, lending the drawings their natural and chance effect of gently undulating water surfaces. The artist’s original intention to “draw long straight lines using a thick black marker” soon metamorphosed into wavy, almost monochromatic structures. Their content isn’t, nor was meant to be, the picture of a quiet surface. Rather, the structures have become a slowly flowing journal of time, place, and the artist’s thoughts and creative presence. They evoke the smell of cigarettes smoked, the sound of the music Pavel was listening to while working, the evening games played by the flickering lamp lights from the opposite river bank on the ceiling of the temporarily inhabited studio. Quiet Surfaces result from the concentrated and conscious layering of black lines on paper whose varying intensity the artist achieved by using new and used markers. He then washed their marks, intending to obtain the hidden rainbow of black. The drawings give the impression of photographs, but they also reveal the artist’s intense presence and the physical aspect of his work—his approach to the drawings and his retreat from them, movements that take shape in their wavy structure (Quiet Surface I, III, IV). The physicality of Pavel’s drawing is highlighted in the second part of the cycle (Quiet Surface V ̶ X), in rollages, in which he dissected the drawing into thin numbered stripes, which he then glued according to a pre-defined pattern. By placing variously undulating lines close together or by allowing for larger gaps between them a new picture was gradually created. Unlike the father of rollage, Jiří Kolář, Pavel Skrott was not interested in the layering of meaning from two different intertwined pictures; instead, he discovered the visual aspect of almost identical intertwining pictures, especially at the point where their different structures meet and part. In fact, in his Český Krumlov cycle, Pavel Skrott combines, for the first time, all the techniques he had used separately in the past seven years. The series Quiet Surfaces is surprisingly complemented by Levitating Embryos and Lotuses, two by-products of Quiet Surfaces. The artist describes them as “the dark side of the black drawings.” After putting water on the black-painted side, the sheets of paper began undulating and, mirror-like, rainbow stains soaked through, appearing on the back side. Pavel then “rollaged” these “accidental” drawings, creating the fragile Lotuses, a work that befits the artist’s concept of minimalism and brings a touch of reality into his abstraction, an element of the accidental along with conscious acts of drawing, gentle colours within a monochromatic palette. Thanks GoOut for PR support.